For Astrid, a blacksmith who makes swords for dragonslayers, the emergence of a strange gemstone from her body sets in motion a chain of events that threaten to destroy her life. Her happiness is shattered when her lover-the dragonslayer-disappears without a trace, and the life that she knows and loves implodes without warning. Astrid lives in a world of shapeshifters whose thoughts have the power to change not only themselves but others. Everything Astrid knows to be true is called into question when she learns the truth about her past and the mysterious family from which she was separated as a child. Reality turns inside out as Astrid gradually learns the truth about the people she loves as well as those she disdains. With the fate of dragons, ghosts, and slaves in foreign lands resting on her shoulders, Astrid faces the challenge of deciding who she is and how she will stand up inside her own skin. Will she withdraw and hide from the world that has disappointed her so much...or will she rise to lead others to freedom and peace? 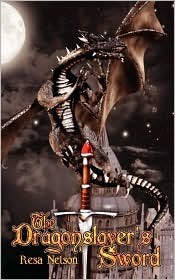 The Dragonslayer's Sword is a unique and very thought-provoking novel. Resa Nelson focuses one young woman's journey to empowerment while fully entertaining fantasy fans with dragons and danger. Astrid lives in a special village, Guell, where people are able to change their appearance at will, however it suites them at the moment. Astrid is self-conscious about her body because she is scarred from a dragon attack. The only people to ever look at her as if she were normal are her blacksmith mentor, Temple, her best friend, Mauri, and her dragon slayer lover, DiStephan. Since he's disappeared, life isn't the same for Astrid and it becomes even more trying and filled with trials as her story unfolds. Astrid, along with the many fascinating characters introduced, is well developed and compelling. Watching her deal with a traumatizing past while helping others reveals how remarkable she is. Astrid is the kind of character whose attitude will inspire every woman who reads the Dragonslayer series! The fantasy aspect seems to lessen towards the end of the novel. The fact that the mysticism of Astrid's world has reasonable logic behind it makes the shape-changing ability Astrid and her village possess less magical and impossible. The idea behind it, though, that villagers outside of Guell are able to see through their facade, is a brilliant plot twist. Hopefully it will be explored further throughout the series. The Dragonslayer's Sword is interesting from the very beginning and even more so as Nelson vividly details this world of dragons. The following installment, The Iron Maiden, is bound to be as captivating and engaging!